9PM. Jan. 26. it is a cold winter night and you are standing on a beach looking out over a dark ocean dimly lit by a crescent moon. A low rumbling sounds arises in the distance and grows in intensity into loud thunderclaps. Suddenly the ground begins violently rocking back and forth, knocking you off your feet. You hear landslides off in the distance as the cliff behind you starts to crumble away. After a few minutes the shaking stops as suddenly as it began; the silence is deafening. Minutes later you spot a dark lump on the ocean’s horizon that grows before your eyes as it approaches the coast. You stand mesmerized by the sight of the massive wave as it breaks offshore and runs up on the beach with the entire ocean behind it. The water rises quickly towards you as you run for your life. Could this scenario happen to people along the NW Pacific coast? It already has, many times. At 9PM on January 26, 1700, an earthquake estimated at magnitude 8.7-9.2 ruptured the subduction zone along 600 miles of the northern California, Oregon, and southern Washington coasts and the subsequent giant tsunami generated hit the coastline between northern California and British Columbia (an area also known as Cascadia) and radiated out into the Pacific. 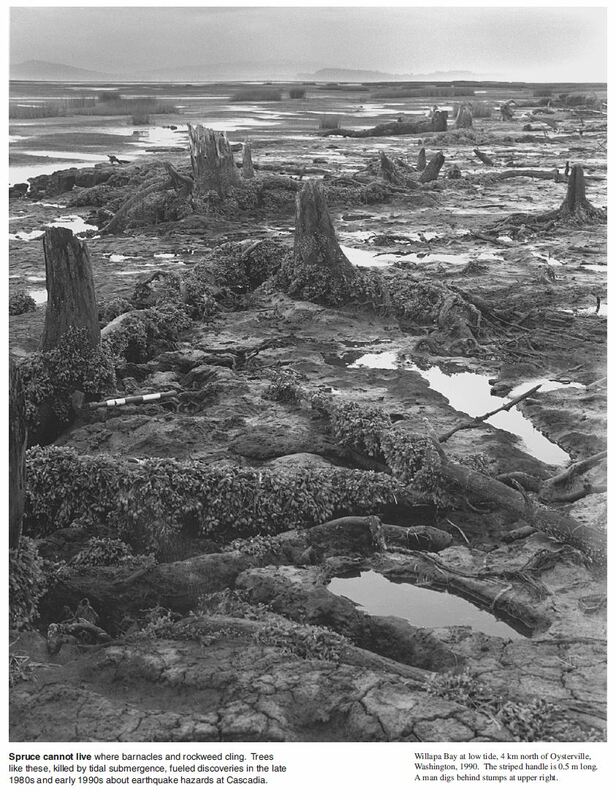 Drowned forests along the SW Washington Coast. From: The Orphan Tsunami of 1700. Researchers, led by Dr. Brian Atwater at the University of Washington, began to explore the possibility of an ancient great tsunami in the 1980s. They discovered evidence of drowned forests and marine sediments pushed miles inland up and down Cascadia from the Mad River near Eureka, California to the northern tip of British Columbia. Eventually the accumulated evidence pointed to a massive tsunami that hit the area around 1695-1720 AD but eventually became stuck on the idea of one big event versus several closely spaced smaller events. Tree ring data narrowed the date down to somewhere between Oct. 1699-June 1700 but there the story stopped — for awhile. Enter Japan, arguably one of the tsunami capitals of the world. Near midnight on Jan. 27, 1700, a tsunami hit the coastline, surprising local residents that were used to tsunamis, but only those following earthquakes. The origin of this “orphan tsunami” as it was subsequently known was the last piece of the puzzle. When the connection between Japan and Cascadia was made the timing was clear: there had been a massive earthquake and huge tsunami along the NW Pacific coast in January of 1700. Since it takes 9-10 hours for a tsunami to travel from Cascadia to Japan, it happened between 9-10PM on Jan. 26, 1700, 315 years ago. 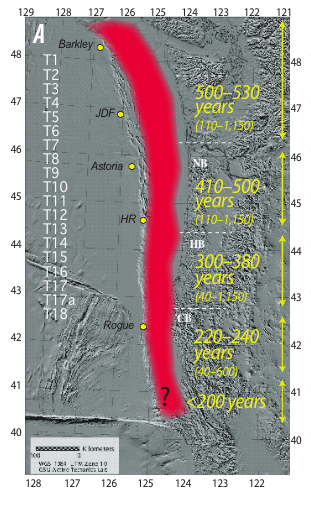 Average times between major earthquakes (ranges in parentheses) in different regions of Cascadia. From Goldfinger et al., (2012). Now 315 years is an interesting number as there is evidence of many similar events at intervals from about 200-500 years in the last 10,000 years; perhaps as many as 22. Dr. Chris Goldfinger, a marine geologist at Oregon State University, and his research team studied evidence of tsunamis from sediment cores in submarine canyons that have recorded thousands of years of major earthquakes which sent sediments flooding down into the ocean depths. Their research found that different areas of Cascadia has different return times (the interval between earthquakes): ruptures of the entire fault line occurs about every 500 years, as in 1700, but the southern margin, including southern Oregon and northern California, ruptures at a more frequent rate, every 220 years or even less. Hence, historically we are within the time range for a major event in the lower part of Cascadia. However, these events are unpredictable and may occur as often as every 200 years or every 1,000 years. The bottom line: Goldfinger predicts that that Pacific NW has a 37% chance of being hit by a magnitude 8 or larger earthquake in the next 50 years of a magnitude similar to the 2004 Indian Ocean earthquake, and the 2011 Tōhoku earthquake and tsunami. As a North American society we are currently ill prepared for these low probability but high impacts events — it just isn’t in our collective experience. 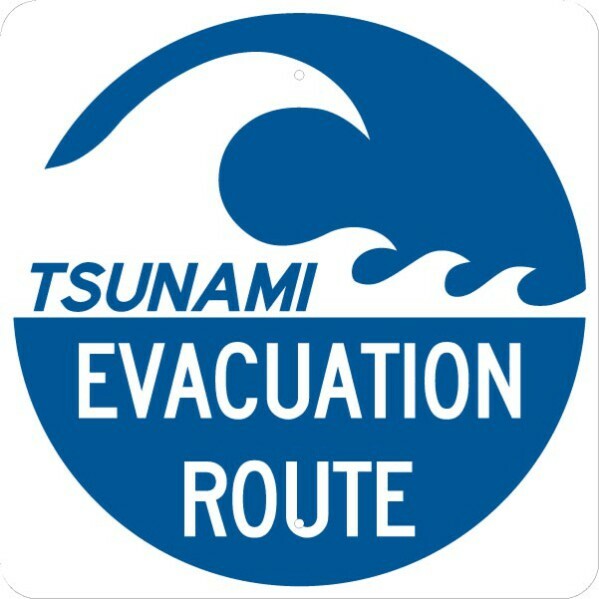 These earthquakes can cause massive tsunamis, and coastal areas in Washington, Oregon and California have prepared tsunami evacuation plans in anticipation of a future Cascadia earthquake. What should we expect? Based on example of other similar subduction zone earthquakes it is likely that the quakes itself will last between 2-6 minutes, followed by anywhere from 11-59 aftershocks (magnitude > 6.0). All large earthquakes generated tsunamis, which ranged in height from 10-100 feet. CREW, the Cascadia Earthquake Working group, has evaluated the potential impacts of such an event and the results are staggering: deaths could exceed 10,000 with up to $70 billion in damages, The nightmare scenario is that coastal regions would likely be isolated as infrastructure collapses. In Oregon, for example, along Interstate 5 (the main transportation corridor) 19 bridges would suffer severe damage and five would likely collapse; on U.S. 101 along the coast the scenario is even more grim: of the 135 bridges, 42 would be heavily damaged and 56 would likely collapse. For more information see the CREW report listed below. Violent shaking will last at least two minutes. The ocean floor will drop, most likely creating a tsunami that will strike long stretches of the coast. Some areas may suddenly rise, while some coastal areas will sink below sea level. Get under a sturdy object and hold on. Watch for falling objects. Listen to your local radio station for an official “All Clear” notice before returning to the coastal area. Develop a family disaster plan. Everyone needs to know what to do on their own to protect themselves from an earthquake. Be prepared to survive on your own for a minimum of a week. Prepare a disaster supply kit for your home, automobile and work.